I'm always a big fan of including a dress code on wedding invitations. Guests that live in your area might be able to guess the formality based on the location, but out-of-town guests won't have a clue! Save everyone from embarrassment of being under- or over-dressed by adding a little line on the bottom of your invitation with the suggested attire. White Tie (channel your inner Downton Abbey) Men: Tuxedo with tails, a white vest, and a bow tie. White gloves are appropriate for dancing. Women: A formal, floor-length evening gown, preferably in a dark color. 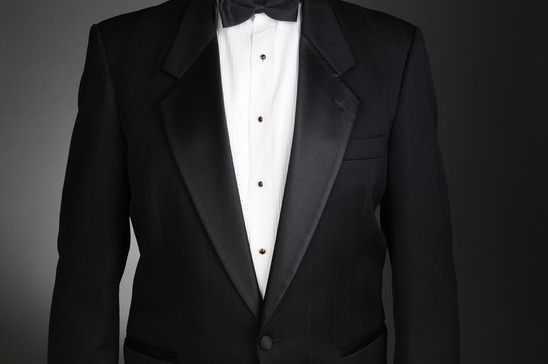 Black Tie Men: Traditional tuxedo, preferably with a black bow tie and cummerbund. (yes, you'll look like a maitre d', but so will everyone else) Women: A long dress or a formal cocktail-length dress in a dark color. Semi-Formal Men: Suit and tie, either light or dark depending on the season and time of day. Wear darker colors for evening, lighter colors for daytime. Women: Cocktail dress or other dressy dress. For even more attire guidelines, check out EmilyPost.com's Attire Guide.